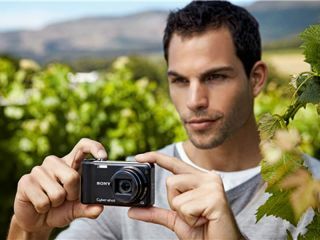 Sony has (unsurprisingly) announced it will be rebooting its range of Cyber-shot cameras at CES 2010. The highlights of the 12-strong new additions to the Cyber-shot range are the HX-5 and the W380, with Sony claiming both evolve the abilities of compact photography. The HX5 offer 1920 x 1080i video in AVCHD format, alongside the 10.2MP sensor, with GPS sensor for easy geo-tagging of your photos, and even includes a compass to show exactly what you were shooting at (although you could just look at the picture). The HX5 also features a 10x optical zoom with a 155 minute battery life and an ISO range from 80-3200, and a 3-inch LCD screen for viewing you snaps back quickly. The W380 seems to be more about style, with Sony highlighting the slim frame (91.7mm x 51.9mm x 19.7mm), as well as a range of colours, including red, black and silver. It also packs a 14.1MP sensor, five times optical zoom and a smaller 2.7-inch LCD screen, along with Sweep Panorama for your basic widescreen shots. Among the other highlights from the range include The TX7, with a large 3.5-inch widescreen LCD and 1080i video shooting, and the S2100, with a 12.1MP sensor and 3x optical zoom lens, although the latter doesn't feature video recording. The HX1, TX1 and WX1 will also all feature intelligent panorama mode, which Sony says is capable of stitching together even moving panoramas, with an algorithm working out which bits were supposed to go where for seamless pics. The full range of Cyber shot cameras released is: Cyber-shot DSC-HX5, DSC-W390, W380, W370, W360, W350, W330, W320, W310, DSC-TX7, and the DSC-S2100 and S2000. All the cameras will be available from the end of January 2010, although we're still waiting on confirmation for a UK release date.